Once the scribes and illuminators had completed their exemplary work on the vellum pages the quires were re-assembled in the correct order and the binder would start to sew each quire with linen thread around upright thicker leather thongs within a binder’s frame, tying up on each leather thong in turn. He then continues sewing through the leaves of the quire and onto the next quire until all the gatherings were sewn together to form the text-block. A book with say 40 quires would take a skilled binder a day to stitch a text-block together. Released from the binder’s sewing frame the text-block would then be, literally, knocked into shape to form the familiar convex/concave profile. The text-block would likely be clamped into a laying-press to enable the binder to treat the edges of the pages with gold leaf using a soft guilder’s-tip brush. He would lift the fine fragile gold leaf by passing the brush once through his hair to obtain enough static to gently lift and place the gold into place on the vellum edges. The gold leaf is finally burnished with a ‘dog’s tooth’, a smooth hard stone such as agate to dress the three exposed edges with lustrous gold. The five, six or seven thongs (depending on the size and nature of the book) used for sewing the quires together are now cut off long enough to form the coupling of the text-block to wooden boards. Two wooden boards, made from oak or beech, would be cut, planed and smoothed to fit the front and back of the text-block to form its protective covers and to keep the leaves together. Grooves are cut into the boards to enable the thongs to fit into the wood and then are glued into place, thus forming the initial strength of boards to block. The thongs are left raised on the spine and glued again when the leather binding is adhered. 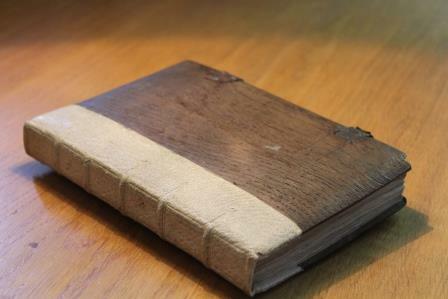 A complete binding of tawed or tanned leather is cut and prepared to be stuck onto the boards, or just a partial covering for the spine and part of the boards. We have a very good example of a partial leather binding on plain untreated oak boards at St George’s Chapel Library, see fifteenth century LIB MS 2 ‘Examples of Scriptures’. This book has five ‘raised bands’ on the spine. The advantage of leather bindings were the infinite variety of decoration that could be created; from blind stamping designs to gold-leaf embellishment to luxurious commissions from royalty or church, whereby precious gem-stones, smithed metal designs, miniature enamels and elaborate arms would be applied to the boards and spine, thus creating the most treasured contemporary possessions and, as has been proven, enduring and expensive works of art. Other than leather bindings forming a tight covering around the book, a rather rarer protection was a chemise cover. Usually meant for a private devotional books such as Books of Hours; an expensive dyed and decorated fabric would be attached carefully to the book and be cut and finished off long enough to wrap around the entire illuminated manuscript to protect it. 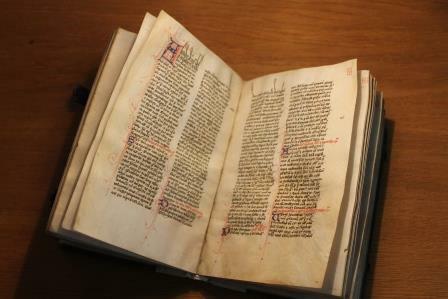 The saying, ‘You can’t judge a book by its cover’…in the case of medieval manuscripts, is invariably wrong! For an informative and delightful Gresham College lecture from Dr Sally Dormer of the V&A speaking about the fascinating subject of manuscripts, please see ‘The Making of Medieval Manuscripts’ on YouTube. My references for this series of blogs are as follows. ‘Making an Illuminated Manuscript’. Stella Panayotova and Teresa Webber (2005) Cambridge. ‘Collectors and Collecting’ Christopher de Hamel (2005) Cambridge. ‘The Wormsley Library’ Maggs Bros (2007) London. Gresham College Lecture Series Sally Dormer (2012) London. My special thanks go to Dr Clare Rider and Kate McQuillian, Librarian and Archivist and Assistant Archivist respectively at St. George’s Chapel for their kindness, patience and help with my research on this project.